Time is flying by! My little Peanut is already 4 months and I am back at work. 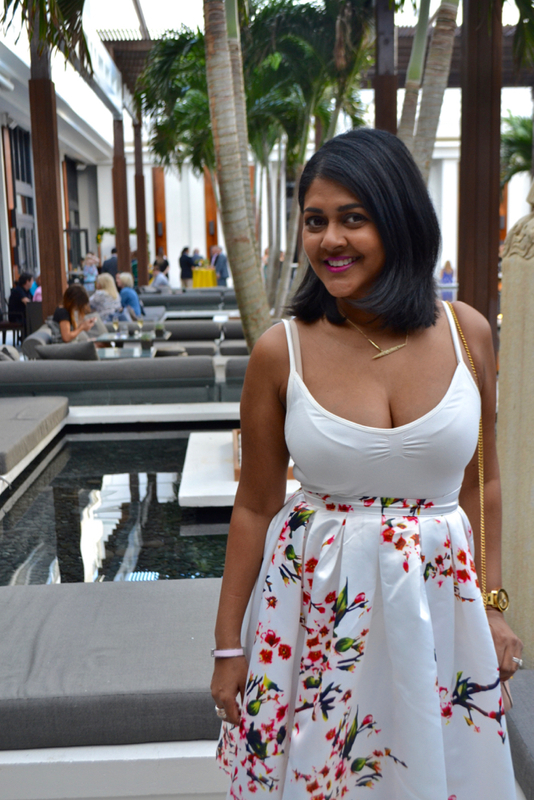 My time off for maternity leave was a great bonding experience and I am so fortunate to have been able to a majority of it down in Miami with friends and family. I spent 6 weeks in Miami and now miss it more than ever. 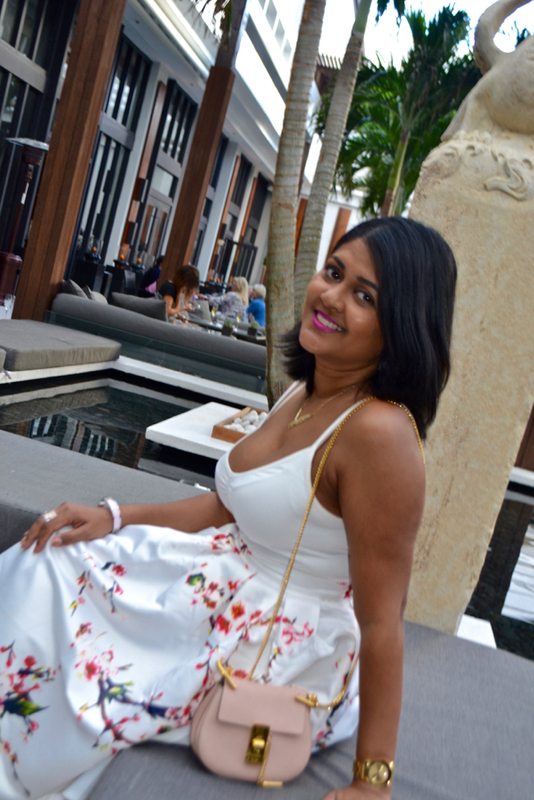 However, while I was down in Miami, I made sure to fully enjoy the warm weather and be outside as much as possible. While down in Miami, a friend of mine celebrated her upcoming birth with a brunch on South Beach. I was so happy that I didn't have to pile on the jackets and sweaters. It was great to be able to wear spring attire in February! That is definitely a perk for South Florida. One of my first purchases after giving birth was this gorgeous skirt from Make Me Chic. This site provides the latest fashions at the most competitive prices and also has exceptional customer service. For me, when it comes to trendy pieces, I prefer to not spend too much as trends are fleeting and this site is so affordable, it allows you to try new styles without breaking your budget. Make Me Chic also offers handbags, shoes and swimwear. With these low prices, one would be skeptical about quality but I can first hand say that this skirt is worth its price and more. The fabric of this white floral pleated skirt is very heavy and the shape is perfect. It looks exactly how it appeared on the site and it even more beautiful in person. This skirt is such a statement piece on its own that I kept the rest of my outfit very simple with this spaghetti strap tank top and pink closed toe heels. 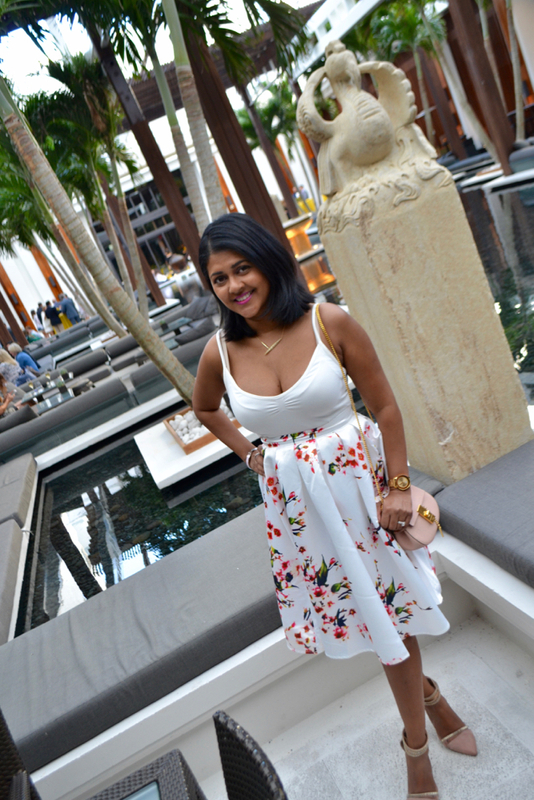 This outfit was perfect for brunch at the Setai to celebrate my girlfriends new arrival. The sun was shining and the champagne was flowing. Even Peanut enjoyed herself, she came everywhere with us while we were down there! More to come about our time in Miami!